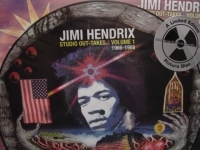 "Jimi Hendrix, Studio Out-takes Volume 1, 1966-1958 (picture disc) - Last Copy"
JIMI HENDRIX - STUDIO OUT-TAKES...VOLUME 1 1966 - 1968 A PICTURE DISC Numbered Limited Edition - 180 Gram LP - 3,000 Pressings The tracks assembled for this, the first volume in a 3-volume set of rare Jimi Hendrix studio out-takes, are from 1966 to 1968 comprised of forgotten versions, forgotten songs and recordings that were found in studios, lofts, garages and basements. The false starts and abrupt endings are all part of the experience; the magic moments that provide a unique insight into one of rock's true sonic explorers. This is Jimi Hendrix in the studio, working behind closed doors on works in progress. Side 1: 1. Voodoo Chile - Originally recorded at the Record Plant in New York in May 1968 during an ABC-TV filming of a feature on Hendrix that included interviews with Michael Jeffrey, Chas Chandler and Eddie Kramer. This version has studio effects that were added later. 2. La Poupee Qui Fait Non (previously unreleased) - An unfinished instrumental track recorded at an unknown studio (probably De Lane Lea in London) with The Experience in March 1967. 3. One Rainy Wish - Recorded with The Experience at London's Olympic studio in October 1967. An alternate mix to the version found on Axis Bold As Love with additional guitar. 4. Angel - An early version of one of Hendrix's most haunting ballads beautifully recorded at his flat in the spring of 1968. The sound quality is fantastic. 5. Look Over Yonder - Originally called Mr. Bad Luck, this is an early alternate version recorded at Olympic Studios on May 1967 with The Experience. One of the earliest Hendrix-penned songs. Side 2: 1. 51st Anniversary - From January 1967, this alternative version was recorded with The Experience at De Lane Lea studios. This was the first Experience recording to feature over-dubs instead of retakes. There are at least 5 guitar over-dubs on this version. 2. Can You See Me - Another alternate version recorded at De Lane Lea in November 1966 with The Experience. This is a rough recording done during time remaining at the end of a session. The over-dubs were added later. 3. Cat Talkin' To Me - Recorded at Olympic Studios in January 1968. The original version was recorded the previous year and featured Mitch Mitchell on vocals. 4. Red Houses takes 1 - 4 - Alternate takes from a recording session at De Lane Lea studios in March 1967. The original version from the previous December appeared on Are You Experienced. The four takes are continuous, which, along with the banter between Hendrix and Chas Chandler in the Control Room, creates a truly involving atmosphere. These particular versions were never used due to the missed notes from both Hendrix and Noel Redding. 5. Fire - Instrumental backing track recorded at Olympic studios in February 1967 with over-dubs added during later sessions in March and April.